White water rafting is an extreme and thrilling outdoor activity in which, using an inflatable raft, people navigate a river and its exciting rapids. Rapids are the sections of a river where the riverbed has a relatively steep gradient, causing an increase in water velocity and turbulence. In the beginning, rafting was a mean of transportation for people and food; but after some time, rafting companies were established in routes like The Grand Canyon, and this made that rafting started to be considered an extreme sport and part of the adventure tourism offer in some places. In fact, white water rafting became a popular leisure sport since 1970's, and has evolved from individual rafts to multi-person rafts steered by a tour guide at the stern. The American White Water Rafting Affiliation (AWA) made an international classification of the difficulty of the rapids, which is used to date and worldwide. This classification specifies six grades or classes of river rapids, and each grade reflects the level of difficulty and the necessary technical skills associated with the section of the river. It's important to mention that the same river can have different classes of rapids and the grade of a river may change with the level of flow. Class I: EasyMoving water with small waves that tug at the boat - it's a relaxing way to spend the day. Class II: NoviceEasy rapids, waves up to three feet tall that are readily seen, and wide channels that can be discovered without scouting. Some maneuvering is required. Class III: IntermediateWaves up to four feet and narrow passages that make the boat oscillate. Plenty of excitement. Class IV: AdvancedLong, difficult rapids, narrow passages and turbulent water that requires precise maneuvering. Class V: ExpertAll of the above and then some - large, complex, gushing rapids, twisting, and spinning. Class VI: ExtremeThe ultimate extreme, only the most expert should attempt this. Raft trips don't go here. One of the most important things to know about White Water Rafting is that safety is the main rule. In fact, if the expert or guide thinks that is not safety to run a river, nobody is going to enter the river. Following some important safety rules, rafting can be an unforgettable experience! 1. Choose a licensed and professional rafting tour operator. 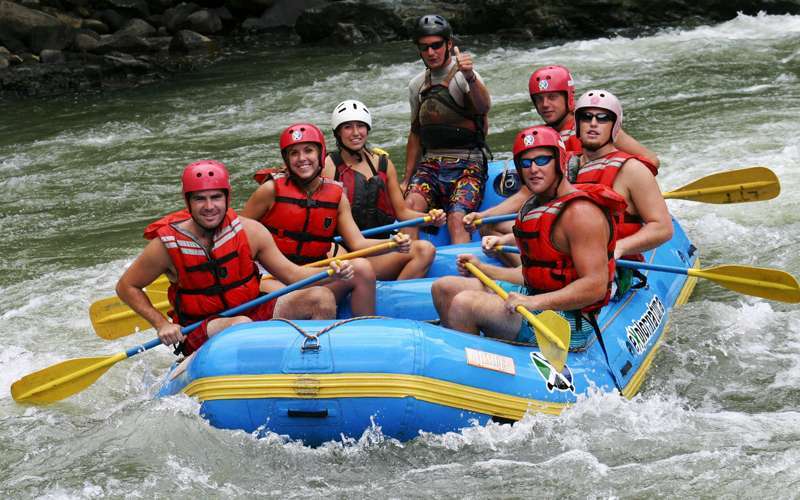 When booking a White Water rafting tour, see how long the tour operator has been in business, if the company has all the insurances update and what kind of training their guides have. The first step for a good tour is a serious company in charge of everything. 2. Always wear a life jacket, or personal flotation device (PFD). Although just because you wear a life jacket, it doesn't mean it will save your life. It must be worn correctly; with all buckles clipped and fitted snug to your body. The trick here is to have the jacket fitted so you can breathe yet the jacket should not be able to be pulled up over your head. Always have your professional guide fit your jacket. 3. Be safe and comfortable. Wear the protective gear. Always wear a helmet, no matter what level of rafting you are participating in. 4. Stay in the boat! This sounds like common sense, but it can happen. One minute you are in the boat and the next you are swimming next to it. When rafting, pay attention and watch for rocks coming from downstream. If you fall out of the boat, the most important thing to do is… DON'T PANIC! If you are panicking you won't think about getting back to the boat and the rescue becomes more difficult. 5. Listen to your guide during the safety talk and on the water. Your experienced rafting guide is trained to know exactly how to handle any type of situation encountered while on the river. Pay attention to the guide when it's explaining important things such as the way to hold the paddles or how to swim if you fall off the boat. In the safety talk will be explained all the commands you will use during the tour. The commands you agree will assure the enjoyment of the group. Nearly everyone can participate in a White Water rafting expedition, but people with any medical condition, very overweight or in poor physical shape should always consult with their physician before doing it. For example, those with a heart condition or back problems should be particularly cautious. Tour operator usually don't have a specific weight limitation, however, each participant must fit into one of the life jackets with all buckles fastened (the regular flotation devises (PFD's) fit a torso circumference of 52 inches maximum.) For younger children, must also be ensured that PFD's fit correctly, and that is the reason for the usual minimum age that rafting tour operators have. Like all outdoor activities, White Water rafting must balance its use of nature with the conservation of rivers as a natural resource and habitat. Because of these issues, some rivers now have regulations restricting the annual and daily operating times or numbers of rafters. Rafting contributes to the economy of many regions and additionally, white water rafting trips can promote environmentalism. By experiencing the beauty of a river, individuals who would otherwise be indifferent to environmental issues may gain a strong desire to protect and preserve that area because of their positive outdoor experience. Costa Rica has the blessing of water! Two coasts and countless rivers and lakes are perfect for water sports like surf, diving, kayaking, paddling, floating and of course, white water rafting. 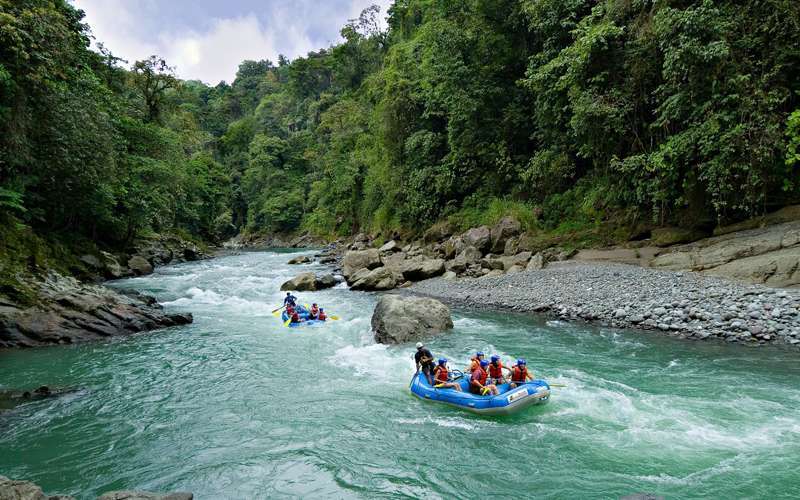 Its location, and all the mountains, waterfalls and perfect weather, are some of the reasons why Costa Rica has been named one of the best places to do white water rafting in the world. In fact, a World Rafting Championship took place here, due to the perfect place this country is for this exciting sport. Sarapiquí is a beautiful river and a good option for beginners. A tour here can be done as a day tour from San José or Arenal…or even in the way! This Atlantic river has a wild beginning and a smooth float at the end; and it's ideal for nature lovers and particularly, for those who enjoy bird watching. Recommended from May to mid-March. Its name means: "crashing waves", and the river do merit its name! A tour here can be done in four different sections of the river; therefore, you can make a tour from class II to class IV depending on the experience level you have. If you're a first-time or an experienced paddler looking for the excitement of big waves, hydraulics, and stunning scenery, then this trip is for you. Recommended all year long. The longest and most spectacular river trip in the country! In fact, a two-day trip is recommended. Pacuare River is the jewel of the rapids in Costa Rica and it's in the list of the 10 best rivers for rafting and kayaking in the world due to the impetuous combination of natural beauty and excitement. The experience of running Pacuare River can't be easily forgotten. Its narrow course crosses some incredible dense forests and is adorned with at least 20 waterfalls. The Temples waterfall located here is one of the most amazing natural beauties of Costa Rica. Recommended from mid-May to mid-March. Another beautiful river, perfect for the first rafting experience. A tour here can be done from Jacó Beach or Manuel Antonio National Park. Savegre River has an excellent tropical scenery, exuberant flora and fauna, and refreshing river pools ideal for swimming all year long. Recommended from May to January. A thrilling but full-of-nature river, located near from Quepos. It can be also done from Jacó Beach or Manuel Antonio National Park but a little bit of previous experience may be required for rafting this river. Rafters should be physically fit and ready for adventure. Recommended from June to November. Corobicí is an easy river perfect for beginners, elderly people and families. Traveling through lowland dry forest on this swift, soft white water river allows for some spectacular wildlife and scenery observation. Several species of monkey, sloths, iguanas, otters and over 300 types of birds can all be viewed from the river. Recommended all year long. All tour operators have a minimum age required for this kind of tours. If you are traveling with kids, it's important to ask the minimum age to avoid misunderstandings once you get to the river. What to bring to a rafting tour? Sneakers or sandals with a back strap, easy drying clothes, shorts or long pants depending on weather, sunscreen, bathing suit, towel, waterproof camera. Bringing a change of cloths is recommended because, obviously, you will get wet on these tours. Be clear regarding levels of difficulty. Inexperienced or fearful rafters should stick with lower levels. Depending on which region of the country and which river you'll be rafting, there are many trip pack­ages suited for families and thrill seekers alike. Different sections of the same river can vary widely in difficulty, so be sure to ask a lot of questions about what kind of trip you are buying.